Euromonitor International, an international market research company, recently published their special report on the global market for household appliances, and Haier came out as the undisputed market leader. Qingdao, China - April 17, 2018 /PressReleaseAgency/ — Euromonitor International’s latest market research report was published in the first quarter of 2018, and the report suggests that Haier continues to be the market leader with a whopping market share of 14.6% for the ninth consecutive year. The report shows that Chinese brands dealing in household appliances have taken a leading role in establishing their foothold in the domestic as well as the international market. It also indicated that Haier is now growing its presence in the washing machine market as well. 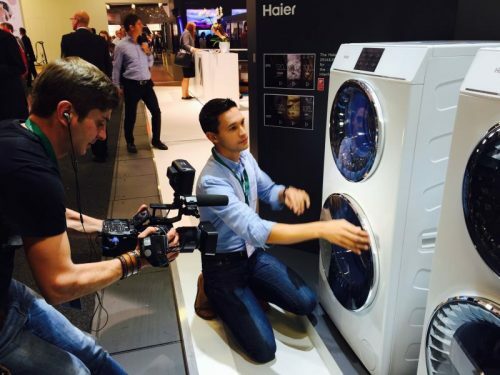 On April 15th, Haier’s “air washing” technology attracts wide attentions from visitors and media at the 123rd Spring Canton Fair 2018. The pioneering technology invented by Haier makes their washing machine more advanced than their competitors’. It leads the world trend and shows the strength of Haier group. At the trade fair, Buyers from home and aboard expressed great interest in the new washing machine. “Haier is not just making washing machine, they take the lead in the washing machine industry. Haier is the innovation leader and practitioner. We found the trend of world washing machine technology development in their products. “, said an expert in washing machine industry at Canton fair. Haier has produced intelligentized washing machines which features self-cleaning in recently years. Now they focus on “air washing” technology and achieved another great success. Haier washing machine leads the world trend for another time. Haier is a leading manufacturer of home appliances having its manufacturing facilities in China and worldwide. In 2012 when Haier brought in their first ”dual-power” washing machine, which was the first of its kind with an inner drum. The company also pioneered “fourth washing power mode”, and manufacturers in the US and South Korea followed the suit soon. Back in 2014, the Chinese manufacturer of home appliances launched the first ever ‘washing free’ washing machine. The product was marketed for six months, and similar products started to flood the market. In 2015, the world’s first double-drum washing machine was invented by the company, which gave the birth to a new trend “separate washing”. Three years on, “separate washing” has become the market standard. In 2017, Haier launched the air washing technology, which was the third alternative way of washing in the world after water washing and dry cleaning. In the same year, they launched the fast and directly-driven washing machine. According to statistics, the original technology of Haier washing machine has been imitated by other manufacturers for twenty times. Haier will certainly roll out more innovative products in the future.